Conflict is often thought of as being only negative. However, it can actually be the environment where God's faithfulness is demonstrated to us. 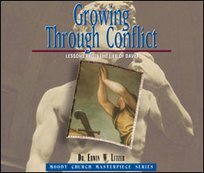 In this series, Dr. Lutzer shares from the turbulent life of David and how God was faithfully by his side through it all. Even in the midst of the most tragic and trying times of our lives, God is there, and He is willing to help us grow through our conflicts.